But defeat wasn't part of the equation in the seventh century BCE. They were the rulers of the Median Empire after they allied with Nebuchadnezzar II of Babylon (hanging gardens' fame) and overthrew the Assyrian empire. A semantic irony: The Kurds, the original Aryans, became allied with the Israelites after the Assyrian king, Tiglath-Pilasar III took the ten (lost) tribes of Israel captive and resettled them, according to the Bible, in the land of the Madai (the Medes). And it was the half-Mede Cyrus the Great who freed the captive Jews from Babylon in the sixth century and sent them home with the funds to rebuild their temple. But what does this historical alliance say about the Sunni Kurds? These ancient people who do not carry prejudice toward Jews, toward Shi'a, toward Christians, toward anyone? Zoroastrianism is uniquely important in the history of religion because of its possible formative links to both Western Abrahamic and Eastern Dharmic religious traditions. Some scholars assert that key concepts of Zoroastrian eschatology and demonology are evident in the Abrahamic religions, for instance in the Asmodai of Judaism. However, Iranologists also tell us that Zoroastrianism inherited ideas from other belief systems. As such, Zoroastrianism, like other practiced religions, revealed or otherwise, was not immune to syncretism. For example, one of the popular strains within Zoroastrianism considers both good and evil as creations of God. According to some historians, this is a doctrine that influenced Christianity and notwithstanding the great deal of exposition in order to not compromise Zoroaster's otherwise coherent concept of Free Will, has a widespread following. It is said that Kurds hold their Islam with a "light touch." This was exhibited during an interview with the Kurdish police chief in Kirkuk, where he laughed off a question about whether the ethnic divides in Kirkuk were religious in nature. He replied, "I am a Kurd, we were Yazidi, we were Zoroastrian, we do not ask what anyone believes. I may be Sunni, but I am a Kurd." For Kurds, their Zoroastrian roots are not far from the surface and the idea of judging another by their religion is as foreign to them as giving up their traditional nightly whiskey for Islam. They are Kurds first and Sunnis or Christians or Yazidis or Zoroastrians or Jews or Alevi or Zaza... -- those are all religious and/or tribal groups within the wider Kurdish historical identity -- and this sense of historical identity lives within every Kurd I have ever met, all of whom are Kurdish first. This is best demonstrated in a treasured poem written by Cigerxwin (which means: the bleeding heart), a pseudonym for Sheikmous Hasan, a great Kurdish poet who was forced into exile from his native Turkey in 1925.
and I don't want to be forever oppressed. Serdarê meye gernas û nebez. Friendship I seek and offer my hands to all friendly nations. If that doesn't illustrate the duel nature of the Kurds.... They want peace, they crave it, they are near secular by nature (Kurds hold their religion with a light touch), drawn to democracy, struggling to reach an equality of the sexes that their original religion (Zoroastrianism) promoted, though they would be the first to admit they're still working on that, and, in the spirit of optimism, the Iraqi Kurds are heavily investing in their infrastructure in the middle of the chaos that has yet to cross their border, thanks to the efficiency and fierce fighting reputation of the Peshmerga who guard the lands. It seems that no one wants to fight the Iraqi Kurds, not the Sunni (many Kurds are Sunni), not the Shi'a, whom have formed a coalition with them, hopefully not Turkey (more on that later) or Iran. That's because, for all their civility, the Kurds have a dark side; that "death to the oppressor" side which is manifested in the ancient practice of blood feud. Kill my brother and I will kill anyone you might even be related to, through all your generations until your kind no longer exists. But could they carry out such a threat? Just how many Kurds are there? What makes them, this may come as a surprise, the world's largest stateless minority? Where they are, according to the EU, severely oppressed -- a situation the must improve dramatically if Turkey hopes to gain EU membership. Removal of the ban on the Kurdish language being spoken over airwaves (radio and television) and in parliament. In response to EU pressure, these bans have been lifted, but, as with voter registration in the '50's south, not all officials have gotten the memo. Southeastern Turkey (the Kurdish region) is devastatingly poor and, because of the presence of the PKK, the Kurds are caught in an increasingly tightening vise between the Turkish authorities and the PKK. And with the growth of opportunity in Iraqi Kurdistan, there are Kurds in Turkey who are increasingly aching for the freedom and prosperity they see blossoming across the border, which increases the pressure on both the Turkish authorities, who fear such a large segment of their population's dreams of independence, and the Iraqi Kurds who are trying to navigate an increasingly unstable region. Kurds are the third most important ethnic group in Iran after the Persians and Azarbaijanis and account for about 9 percent of the total population. They are concentrated in the Zagros Mountain area along the western frontiers with Turkey and Iraq and adjacent to the Kurdish populations of both those countries. Most of the rural Kurds retain a tribal form of social organization. The Kurds have manifested an independent spirit throughout modern Iranian history, rebelling against central government efforts to restrict their autonomy during the Safavid, Qajar, and Pahlavi periods. The most recent Kurdish uprising took place in 1979 following the Revolution...Intense fighting between government forces and Kurdish guerrillas occurred from 1979 to 1982, but since 1983 the government has asserted its control over most of the Kurdish area. The Kurdish population of Iran has become an infiltrating culture. Because they are also Indo-European ancestry, it is difficult for Iranian officials to tell loyal from spy. Also, the Iranian Kurds practice an equality of the sexes not seen in any other part of Iran. It is rumored that Iranian women are joining the Iranian Kurds as a way to get out from under the veil. It should be noted that the anger the Iranian Kurds feel toward the current regime is exacerbated by the fact that the Kurds believe the current president, Ahmedinejad, was the assassin who went to Europe in '78 or '79 and killed the exiled Iranian Kurdish leader. Now free, Iraqi Kurdistan is navigating between a new reality as the potential tipping point for peace or war in the Middle East. Most Kurds don't see those borders. A Kurd is a Kurd is a Kurd, whether s/he is in Iraq, Iran, Turkey, Syria (see demographic list above) and this map of the Median Empire (historical Kurdistan) -- prior to the British having carved it up post WWI (a fine mess), with the only divisions between them: allegiance to tribe, clan or group. The Patriotic Union of Kurdistan claims to be working for self-determination, human rights, democracy and peace for the Kurdish people of Iraq. The Secretary General is Jalal Talabani, who is also the current president of Iraq. The PUK was a coalition of five separate political entities that united under the leadership of Jalal Talabani also known to Kurds as Mam ("Uncle") Jalal. The PUK received grassroots support from the urban intellectual classes of Iraqi Kurdistan upon its establishment, this was partly due to 13 of its 15 founding members being PhD holders and academics. Originally, the party was a leftist political movement which has progressively moved towards the center ground and has now become a social democratic party and an associate member of Socialist International. The party has its wings in every part of Kurdistan, the KDPI (KDP of Iran), in Syria (Al Party), in Turkey (PDK-Bakur) and even in Lebanon. The PUK ran into some alleged corruption scandals between the two gulf wars (the no-fly zone years), with some of their high level members allegedly manipulating land deals for profit. It is unknown if these issues continue under the new regime. Recently, there was a large oil field discovered near Suleymaniyah, which falls under the Talabani clan's sphere of influence. The PUK and the KDP (see below) have formed a joint government and co-rule Iraqi Kurdistan, with Jalal Talabani as the President of Iraq and Mesud Barzani as the President of the Kurdish Regional Government. There are many members of the Talabani clan in positions of power, with Jalal's relatives in what is equivalent to ambassadorial posts in various world capitals, London, etc, with the most influential, the Kurdish representative to Washington, being Jalal's youngest son, Qubad Talabani, who may be the heir apparent to his father's position of power. The Kurdish Democratic Party of Iraq was founded by Mustafa Barzani, the legendary Kurd who fought numerous revolts against Baghdad with success. It was established in Iranian Kurdistan in 1946. Rebelling against the Iraqi government in the aftermath of the first Gulf War, the KDP became perhaps the single most influential Iraqi anti-Saddam group. Its Peshmerga, or militia fighters, were able to operate with relative impunity in the no-fly zone of northern Iraq. The KDP has jointly administered northern Iraq (which the Kurds call the free Kurdistan, because of its semi-independent status). The KDP is the leading party in the Kurdistan Regional Government in Erbil. Their leader, Mesud Barzani, is currently the President of Iraqi Kurdistan (the Kurdistan Regional Government). His son is the Prime Minister, with other clan members in similar positions of authority and the main body of the Peshmerga forces (the Kurdish Militia) reporting to them. 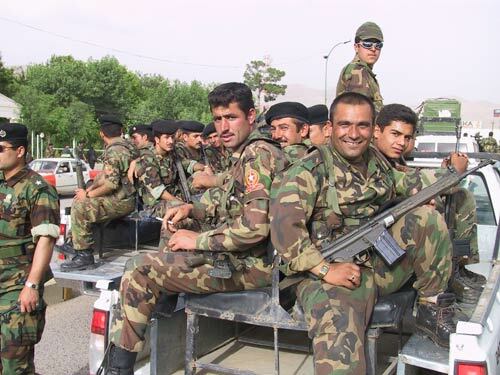 Note: there is a possibility that there are many more Peshmerga than they say and there may be additional militias loyal to the KDP (Talabani Clan), with its offshoots in Iran, Lebanon, Syria and Turkey. There was a scare recently when an Austrian Kurd accused (never proven) one of the Barzani clan of being a Russian agent. Whether this is true or not, the Barzani clan maintains a strong control over the KRG (Kurdish Regional Government regions; their base as Irbil and the Talabani's as Suleymaniyah, with many businesses owned or controlled by one clan or the other (a visitor once reported every gas station between the Turkish border and Irbil has belonging to one or the other). Layers within layers when you're dealing with the Kurds. From Global Security Org: Established in 1974 as a Marxist-Leninist insurgent group primarily composed of Turkish Kurds, by the late 1990s the PKK had moved beyond rural-based insurgent activities to include urban terrorism. The PKK sought to set up an independent Kurdish state in southeastern Turkey, where there is a predominantly Kurdish population. The head of the PKK, Abdullah Ocalan, was captured in Kenya in February 1999. The PKK observed a cease-fire since September 1999, although there have been occasional clashes between Turkish military units and some of the 4,000-5,000 armed PKK militants, and, lately, an increase in violence, including several bombings of tourist sites withing Turkey, with responsibility claimed by the PKK; most of whom currently are encamped in northern Iraq. The PKK has been declared a terrorist organization by the EU and the US. Turkey has stationed ~250,000 soldiers on the Turkish/Iraqi border and is rumored to be conducting cross border raids in an effort to clear them out. If the Turks become too heavy handed with the PKK, they could inspire the Peshmerga, who currently do not openly support the PKK (the have chased them out of Iraqi Kurdistan in the past), to help them. If the Iraqi Kurds declare independence (unlikely, at this point), the Turks may cross the border to keep them from inspiring their own Kurds to do the same (and, of course, there's all that oil there). It is rumored that there may be Turkish/Kurdish refugees living in or near the PKK camps; noncombatants who are there to escape Turkish oppression. If that is the case and fighting creates a risk to that population, the Peshmerga may react to defend fellow Kurds. "Ahmadinejad does not respect the Sunnis. He thinks they are agents of Israel and the USA," says PJAK spokesman Ihsan Warya, an ex-lawyer from Kermanshah. (Most Kurds are Sunni). Warya nevertheless points out that PJAK really does wish it were an agent of the United States, and that they're disappointed that Washington hasn't made contact. 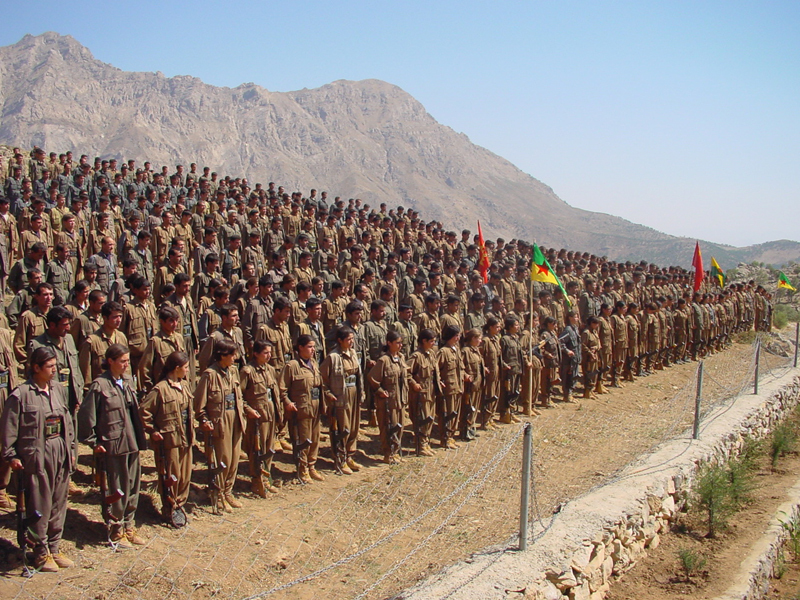 Falling under the leadership of the KDP and the PUK (they each have their own historical forces), the Peshmerga, a Kurdish compound word that means "Those who face death," rumored to be between 100,000-190,000 strong (which means they may be much larger), are considered one of the most disciplined and effective fighting forces in the Middle East. These are well trained mountain fighters, both women and men (the women are considered some of the best amongst them), whom have effectively secured the border of Iraqi Kurdistan, allowing it to flourish amid the chaos of what, otherwise, is Iraq. And what is it that the Peshmerga are protecting? ABC News video link: Where things stand in Northern Iraq (amazing report). Nizar Hana dreams big. Really big. Eleven million square feet, 8,000 shops and 4,000 offices, all in one complex. In Iraq. One can walk through Irbil or Sulaymaniyah and, for the most part, feel completely safe. There is no required veil for women, it is not a Kurdish custom; although there are some Kurds in outlying villages who do practice, much to the dismay of the very independent Kurdish women (and they are very independent) in the cities. There are kids on skateboards, there are girls and boys in schools; the people are happy, excited about their future and protected from the chaos by their disciplined and efficient army (Peshmerga) and a huge trench that has been dug as a barrier between Irbil and Iraq to the south. If a car wants to get into Iraqi Kurdistan, they have to go through a Peshmerga checkpoint. There's no other way around. Which has led to significant investment into Iraqi Kurdistan by international venture capitalists. In addition, they just opened a 300 million dollar international airport with runways long enough for the world's largest planes. To say that there is a spirit of optimism in Iraqi Kurdistan would be an understatement. It's not difficult to see why the dispossessed Kurds of Turkey would look across the border of Iraqi Kurdistan with longing or why the Turks themselves might see that as a threat. The Turkish Kurds are a minimum 20% of Turkey's entire population. If they declare independence, that means civil war; something none of Turkey's neighbors (they're bordered by everybody...) nor its allies and trading partners (US, Nato, EU, Russia), nor its drug mafia (lots of Afghan opium going through there), can afford. Nor can the Iraqi Kurds. That's the key to this. They have peace, they have a negotiating position to work from because of the oil in their territory and they have a bargaining chip to offer. The nature of this chip? As mentioned, the PUK (Talabani) and KDP (Barzani) have, in the past, chased the PKK out of their territory after negotiations with the Turks. 4 October 1992, the Kurdish government in Erbil: "PKK should either withdraw from the border bases or be expelled. Turkish foreign minister Abdullah Gul is claiming that American forces have clashed with PKK/KADEK forces in northern Iraq. ..."It is true that clashes took place yesterday," Gul has said. "Not only U.S. forces but also Kurdish 'peshmerga' fighters were involved in engaging the PKK. Some U.S. helicopters were also deployed. A Kurdish friend was visiting a Peshmerga camp during that period. He was surprised to find the Pêşmerge were cleaning their weapons in anticipation of a battle with the PKK. When he asked them why they were doing it, their commander replied "Ez ĥes ji partî demokratî dikim (I like the Democratic Party)." They have other well known sayings in Kurdistan: "Kurds have no friends but the mountains" and "Leşkerê Kurdî bi hêz e, (Kurdish soldiers are strong)". The two sayings are intertwined. As mentioned above, the Peshmerga are mountain guerillas with a long history of warfare. They are stronger than the PKK and, frankly, one of the reasons you don't see the Sunni/Shi'a violence spilling over the Kurdî border. Kirkuk is the sticking point of any agreement with the Kurds. To them, it's their Jerusalem. They want it and the Turks and the Shi'a and the Sunni and the Turkmen, etc, don't want them to have it -- exclusively, at least. Prime Minister Erdogan of Turkey made that clear on this Dec. 19th Newshour interview. So, he's put his terms forward. Which is useful to the U.S., and not just because of the demographics. It has to do with this oil find in Iraqi Kurdistan. So, now the western oil interests have a self-interest reason to need a stable Kurdistan. There's a Kurdish response. Find a way to bring the Turkish PKK home. Is he trying to help the PKK? Perhaps. Either way, it puts the onus on the PKK if they don't stop their terrorism. In which case, they may just face the Kurdish Peshmerga (those best fighters in the regions) clearing out the PKK sometime in the near future, and/or turning a blind eye as Turkish forces perform cross-border raids to do just that. The question becomes: Will the Kurds help themselves to keep the peace? Qubad Talibani, Kurdish heir appearant, just married an American socialite (here's her govt bio), and lives, for the most part, in the U.S. Either way, the Iraqi/Kurdish border is, so far, secure, and the Turkish/Kurdish border is one place in the Middle East where active diplomacy, albeit behind the scenes, seems to be taking place, partially because the Iraqi Kurds have too much to lose if they get involved in a conflict with Turkey and because Qubad Talabani is married to the woman who is one of the executives of the administration's Millennium Challenge Corporation; which means he is, like many ambassadors, well acquainted with all the Washington power players needed to effectively represent his people and to move the administration to action where they might not otherwise be cognizant of the need. This relative security proves increasingly attractive to other Iraqis. Many are moving up here to settle down and work, particularly those with high skills, like doctors and engineers. There is a new industry in Kurdistan of private medical clinics, staffed almost entirely by doctors from Baghdad. Iraq's small Christian community — about 2 percent of the population before the 2003 invasion, probably less now — is increasingly moving north, too, escaping the violence in the big cities. The Iraqi Kurds are showing they'll take Iraqi refugees in. However, they might not be so accommodating to their own Turkish/Kurdish brethren, because, at 14 million plus, an influx of the Turkish Kurds over the border could not only strain them to the breaking point, it would be perceived as a threat to Turkey's sovereignty. All this adds up to the fact that the Iraqi Kurds are walking a tightrope while they enjoy their sparkling cities and Newroz picnics and their nightly whiskey and proceed with their customary dignity and grace, while putting pretty fiery rhetoric on their websites about the Turks and, at the same time, sending messages like that email from Qubad Talabani, offering everyone a way out. Kirkuk has great historical significance to the Kurds. In addition to being their historical founding city (they refer to it as their Jerusalem), it holds many historical monuments, including one of the two sites purported to be Daniel (as in the Lion's Den)'s tomb. Originally the city was founded by Hurrian-related Zagros-Taurus dwellers who were known as Karda (Kurds), Qurtie or Guti by lowland-dwellers of Southern Mesopotamia. Ancient Kirkuk named Arraphkha, was capital of Kingdom of Gutium which is mentioned in cuneiform records about 2400 BC, and roughly corresponds to much of Kurdistan. But Kirkuk is also considered an historical city to Sunnis, as is it the origin of the Tikriti tribe (Saddam's tribe). The Turkmen also claim historical significance. In 1975, the Iraqi government embarked on a sweeping campaign to "Arabize" Kirkuk. Arab tribes from southern Iraq were enticed to move to the north with government benefits and offers of housing. Uprooted Kurdish and Turkmen farmers were sent to new homes in rudimentary government-controlled camps along the main highways. Some were forcibly relocated to the flat and desolate landscapes of southern Iraq, including thousands of refugees from the Barzani tribal areas who returned from Iran in late 1975 under a general amnesty. In November 1975, an Iraqi official acknowledged that some fifty-thousand Kurds had been deported to the southern districts of Nasiriya and Diwaniya, although the true figure was almost certainly higher. According to some other sources, 1,400 Kurdish villages were razed and around 600,000 Kurds were forcibly transferred to collective towns. Following Saddam's overthrow, in 2003, the Kurds flocked back to Kirkuk to reclaim their homes. Arabs who had been given their properties were evicted in a reversal of the original act by Hussein; which continued until a provincial council was put in place that had representatives from all the different ethnic groups. Since then, Kirkuk has been divided in two; half for the Kurds, an area that is relatively peaceful and half for the Arabs and Turkmen, which is been subject to violence. This is further exacerbated by a recent resumption of Arab evictions, which some speculate could be a prelude to an attempted annexation, by Iraqi Kurdistan, of Kirkuk, which is currently just outside their border. In 1927 a huge oil gusher was discovered at Baba Gurgur near Kirkuk. The Kirkuk oil field was brought into use by the Iraq Petroleum Company (IPC) in 1934 and has ever since remained the basis of northern Iraqi oil production with over ten billion barrels (1.6 km³) of proven remaining oil reserves as of 1998. After about seven decades of operation, Kirkuk still produces up to one million barrels a day, almost half of all Iraqi oil exports. When you hear Congressional Representatives or White House officials say that Iraq must share their oil revenues, they are talking primarily about Kirkuk, the oil fields in the Shi'a region to the south and the potential new oil discoveries in the Duhok region of Iraqi Kurdistan. But Kirkuk is the potential tipping point. Is the Kurd's interest in Kirkuk dynastic or monopolistic? If the former, then it is possible that a land use deal can be worked out with the oil revenues shared. If it is about the oil, then that becomes a much bigger conundrum. But there is that new oil field near Suleymaniyah, which is clearly inside Iraqi Kurdistan. More room to argue, more revenues to share without loss of assumed eventual income. A key factor to watch, as well. What can't be discounted is the historical significance of Kirkuk to the Kurds. When they refer to it as their Jerusalem, they are giving an accurate representation of what the disputed city of Kirkuk means to them, to the Arabs and to the Turkmen. It is their founding city. If they cannot work out a way to have a majority Kurdish presence, it could lead to conflict. However, given how much the Kurds have at stake, I am hopeful they will practice their customary pragmatism and work out a deal. Perhaps it's wishful thinking, but, given what's at stake, a bit of positive affirmation might be a good thing. I say this because the situation with the Kurds is the potential tipping point to a wider war. Remember those demographics? There are (minimum) 30 million Kurds. If the Kurds get involved in a war, many will come home to fight at their side; they love Kurdistan; they will protect it. If that turns into a war with Turkey, then you have all the different Middle Eastern countries with Kurdish populations (and a few in Russia -- that wasn't listed above) worrying whether their Kurds will rise up next. And then it becomes the wider oil war we've been hoping to avoid. The Kurds, of course, are aware of this. It's the reason they have not declared independence. It is also one of the reasons we have not left Iraq (oh, did Bush forget to mention that?). Right now, we need the Kurds to live in peace; to have a reason not to go to war with Turkey. Not that it takes a lot of troops on our part. An American general mentioned recently that there were a total of about seven Americans (liaisons) stationed in Iraqi Kurdistan. When asked why so few, he replied, "it's peaceful there." An anecdote from a dinner with a Kurdish family. Much of what I've written here comes from interaction with Kurdish acquaintances. I have been studying them for over seven years; originally for a book I've been writing and then, as a result of my fascination with them, as a people. I find them unique, graceful, funny, friendly, talented (music is big deal in their culture), with defined personalities and a directness that shows they are not afraid to let you know how they feel. I remember when a Kurd announced I was joining his family for dinner (ten minutes before dinner). His wife waited until he left the room and then told me, "Kurdish men treat their women like sh-t." When he came back, she threw a serving spoon at his head. He followed her around the rest of the night asking what he'd done wrong. He never did figure it out. The food was among the best I've ever tasted -- true Kurdish cooking is amazing -- and then the night devolved into the entire extended family taking out musical instruments, singing a musical version of the poem I quoted above, teaching me each verse in Kurdish and English, with all of us getting drunk on pot-stilled whiskey from which I will likely never recover.